Jo has updated her site! 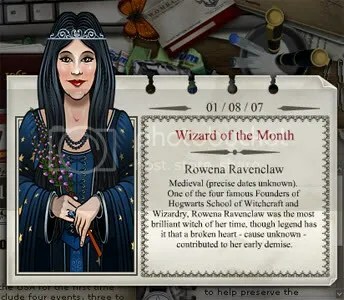 And for August, the new Wizard (or witch) of the month is non-other than Ravenclaw house’s founder, Rowena Ravenclaw. One of the four famous Founders of Hogwarts School of Witchcraft and Wizardry, Rowena Ravenclaw was the most brilliant witch of her time, though legend has it that a broken heart – cause unknown – contributed to her early demise. Though it is stated as ‘case unknown, its most likely to be because of her daughter stealing her diadem. (the tiara on her forehead) I think Jo is really smart to place Ravenclaw as last of the Hogwarts Founders as Wizard of the Month, since the last book is already out, and her diadem plays a major role in the book. You are currently browsing the - My Domain Of Craziness - blog archives for the day Wednesday, August 1st, 2007.